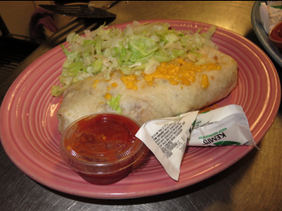 A Minnesota style burrito with savory burrito seasoned beef, fresh tomatoes, cheddar cheese and sour cream wrapped in a tortilla and served on a bed of lettuce, topped with salsa and sour cream. This burrito weighs nearly a pound! Uffda! Our regular burrito, covered with chili, cheese and a side of sour cream. One of our delicious Papa’s pies - loaded with chili, cheese and onions inside. Whoa! What a great combination! Our tangy homemade chili served over thin spaghetti noodles, then topped with cheddar cheese. Served with grilled garlic bread.